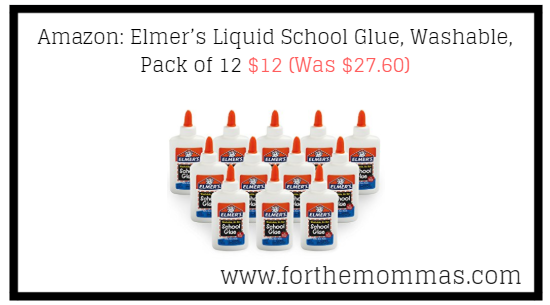 Amazon has Elmer’s Liquid School Glue, Washable, Pack of 12 for $12 (Was $27.60) with FREE Shipping on orders over $25.00 or with Amazon Prime Orders. Kids can create one-of-a-kind slime and assemble arts, crafts, and projects with Elmer’s School Glue. This washable glue provides a fun way to bond together materials like paper, wood, fabric, and ceramics.